The Spectrum Condominium is located at 28 Harrison Garden Boulevard and 30 Harrison Garden Boulevard. The two towers are located just east of Yonge Street and south of Sheppard Avenue. It is within walking distance to all amenities on Yonge Street and the Sheppard Subway Station. If you drive, than it is only minutes away from Highway 401. Built in 2003, the Spectrum looks modern and grounds are maintained and well-landscaped. Security systems are standard in units. Most units have 1 parking space and 1 locker. The amenities are 24 hour concierge, recreation room, sauna, and exercise room. Studio units start at $249,000 for sale. One Bedroom units start at $275,000 for sale and $1,200 for lease. 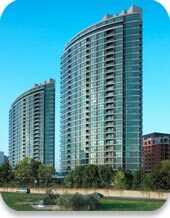 One Bedroom + Den units start at $299,000 for sale and $1,300 for lease. Two Bedroom units start at $328,000 for sale and $1,500 for lease. Large Two Bedroom units start at $549,000 for sale and $1,800 for lease. Categories: North York Condos | Tags: 1 bedroom units for sale, 1+1 units for sale, 2 bedroom + den for sale, 2 bedrooms units for sale, 28 Harrison Garden Blvd, 30 Harrison Garden Blvd, Harrison Grdn Blvd, menkes condo, Menkes Spectrum Condominium, north york condo prices, north york condo search, North York Condo Units | Permalink.